Stay in the centre of the historical Mediterranean old town, just a step away from the social life, cultural events, or the beach. 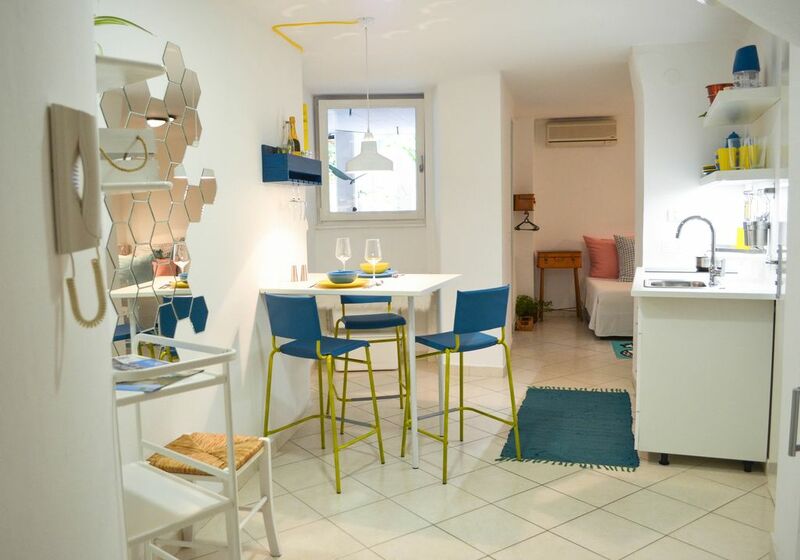 The newly renovated apartment is perfectly situated in the centre of the Izola old town, just off Piazza Manzioli. It is located on the ground floor of four-storey Mediterranean townhouse, with a direct entrance from a small, centrally located artsy square with cafés and art galleries. It has 26m² and is designed in an open-plan to give it a more cosy feeling. The living room has a dining area and kitchen, and it connects to the bedroom. Bedroom can be set up as living room, or with one or two beds (double has 160cm, single with 90cm can be added). From there you can exit to a small covered terrace, which continues on the shared inner courtyard. We have a gas barbecue there to make a summer grill. Apartment is equipped with air-condition, basic Wi-Fi, and linen and towels are provided. Bathroom is equipped with a walk-in shower, sink, and toilet. Hot water is supplied by internal heater. Kitchen is equipped with cooker and refrigerator, microwave, basic utensils, dishes, tableware and gadgets. There is a dining area in the living room, and another one outside on the terrace with a barbecue. Baby cot/crib can be arranged if available and if requested in advance. If you come by car, we can arrange you a parking permit free of charge, with which you can park on one of the streets in the centre near the apartment (less than 5 minutes walk). There is also convenient public transport nearby. Bathroom is equipped with a walk-in shower, sink, and toilet. Hot water is supplied by internal heater. Kitchen is equipped with cooker and refrigerator, microwave, basic utensils, dishes, tableware and gadgets. Apartment has a small covered terrace, which continues on the shared inner courtyard. We have a gas barbecue there to make a summer grill. The rates depend on the number of guests that apartment is booked for. Please mind no parties are allowed in the house. The apartment is in a dense residential area, that's why no excessive noise is permitted. Thank you for understanding! If you come by car, we can arrange for you a parking permit free of charge, with which you can park on one of the streets in the center near apartment (less than 5 minutes walk).